Jean Evelyn (Pinney) Speheger went to be with our Lord on January 30, 2019, four days after her 91st birthday. Jean was born on January 26, 1928 in Toledo, Ohio to Mabel (Lempke) and Clarence Pinney. 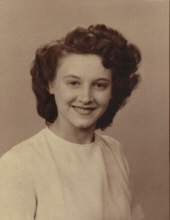 Jean graduated from Woodward High School with the class of 1946. Shortly thereafter she moved to Indiana where she would meet her future husband, John while working at Prices Steakhouse (later home to the Woodduck Café). The couple marred on April 29, 1950 and welcomed two children into their lives, Benjamin and Bard. A self-proclaimed tomboy in her youth, she enjoyed tagging along with her brother (Clarence Jr.) to play baseball with him and his friends. She spoke of how fun it was to ride the trolley in Toledo and of sometimes going into the shop of MASH star Jamie Farr’s father. In her later years Jean loved spending time with her children, grandchildren and great grandchildren, often making trips to the park and pool or setting up a picnic. She loved to watch old mystery movies and was an avid viewer of the Wheel of Fortune. Jean was preceded in death by her parents, Mabel and Clarence Pinney, brother Clarence Pinney Jr. and her husband John L. Speheger. Survivors include sons Benjamin (Laura) Speheger and Bard Speheger; grandchildren Matthew (Brooke) Speheger, Aaron Speheger, Sarah Speheger and Jamie Speheger; also surviving are her 5 great grandchildren as well as many loving extended family members and numerous dear friends. A time of visiting with the Speheger family will be held on Thursday February 7, 2019 in the Van Gilder Funeral Home from 11:00 a.m. to 12:30 p.m.
A funeral in honor of Jean’s life will also be held on Thursday, February 7, 2019 in the Van Gilder Funeral Home at 12:30 p.m. with Chaplain Kristin Harp officiating. Burial will be a later date. To send flowers or a remembrance gift to the family of JEAN E. SPEHEGER, please visit our Tribute Store. "Email Address" would like to share the life celebration of JEAN E. SPEHEGER. Click on the "link" to go to share a favorite memory or leave a condolence message for the family.